At the end of World War II, Americans emerged with a tremendous sense of confidence and optimism. Soldiers came home, but not necessarily to “homes” built to shelter the nuclear family. Their houses or apartments usually had multiple generations under one roof. This home shortage led to the greatest housing boom in history, and with it, the opportunity for young architects to demonstrate their theories about modern architecture on a wide scale. These young architects, eager to pursue a brave new world, believed in moving forward, rather than reviving old styles. The gravity of the WWII experience ushered in a more humane and expressive approach to architecture, as well. The profession alone sought to avoid being perceived as elitist or exclusive. Manufacturers were encouraged to put good quality ‘Contemporary’ design into mass production, reducing the price to the consumer. By 1950 the open–plan modern house gained acceptance. A sense of openness and airiness, and the need to maximize the perception of size by removing physical barriers (like walls and floors), made floor plans of smaller homes extremely innovative. And with these innovative floor plans came newfangled, mass-produced furnishings and décor elements. The MID-CENTURY MODERN kitchen for example, was given a more scientific approach, especially with the advent of technological advances in appliances. In fact, all cooking equipment became more streamlined and less cumbersome. Versatility in furniture, now slimmed down and made lighter, was made for use in both offices and living rooms. Manufacturers like Herman Miller and Florence Knoll were particularly adept at this trend. 1950s home hardware seemed to become more utilitarian, wherein function lived as a style all its own. 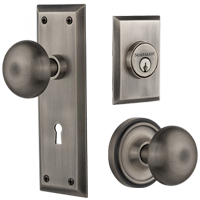 The aerodynamic feel of Streamline Moderne hardware was replaced with more earthbound and solid Mid-Century Modern aluminum and stainless steel pulls, knobs, levers and latches.